I had the weather on my side this weekend! The sun was shining both on Saturday and Sunday, and on Sunday morning, after having taken the second morning walk with Ludde I took a couple of pictures of the mitts. The morning sun was warm, but the wind quite cold, so when I later saw the small bump from my watch on the modeled picture, I decided against going out in the wind taking new pictures with bare hands. 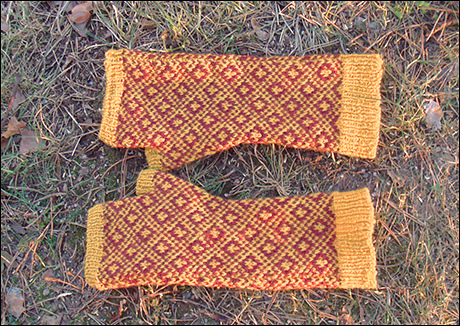 Pattern: Endpaper mitts by Eunny Jang. Alterations: None. Again a superb pattern by Eunny. I especially like the tubular cast on and cast off. WIP update: The Tangled Yoke body is almost done, and the friendship shawl has reached bud row number sixteen. I would have knitted more, but I have been occupied with making own home pages for Ludde, this time working from scratch, and coding the pages with css and html myself. The blog (only in Swedish, sorry) is based on Movable Type. You’ll have the address when they’re done. Warning! Picture heavy post ahead! 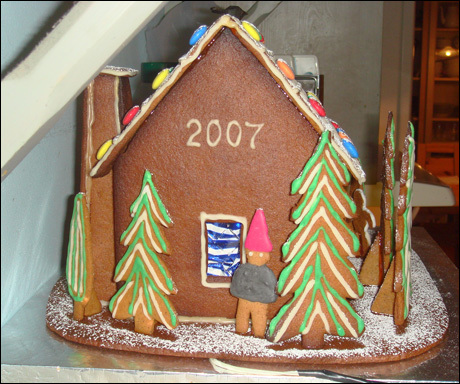 My father has many talents, but one he's practicing every December is to think out and build a ginger bread house for my children. 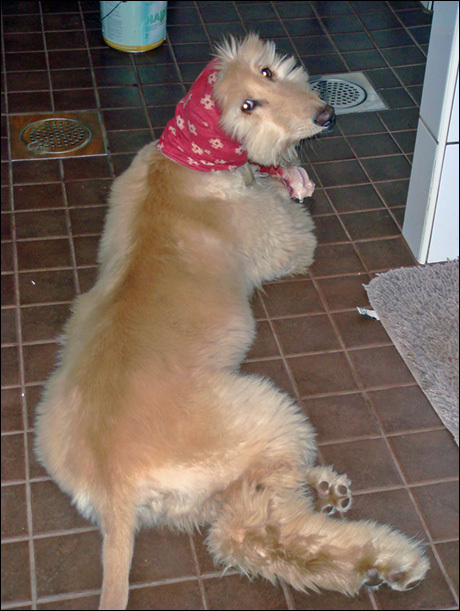 This year we got a small cottage, complete with Afghan hound in the front yard. The horse must be a borrowed one, since such one doesn’t belong to our household (at least not yet ;-). There are five Tomten in the front yard, and one watching out in the back yard. The house is filled with chocolate truffles, and has a window with Jugend glass imitation and light. 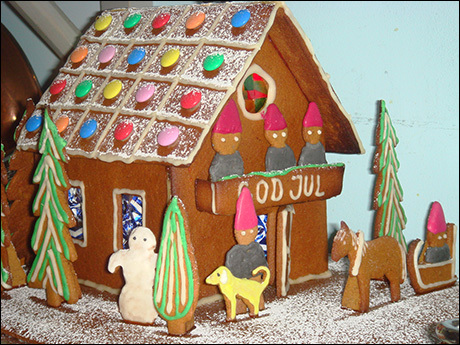 Look at the watching Tomte! Must be the Father in the family, always covering the back of his family. 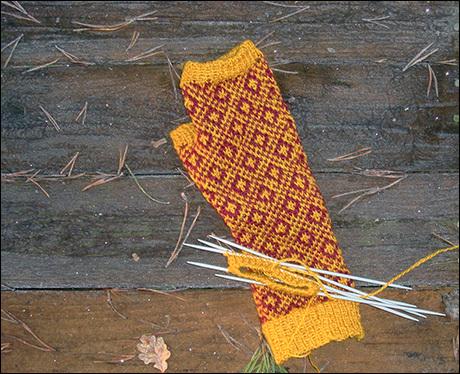 Knitting progress to be reported: The first Endpaper mitt is finished, complete with ends woven in, but not yet blocked. 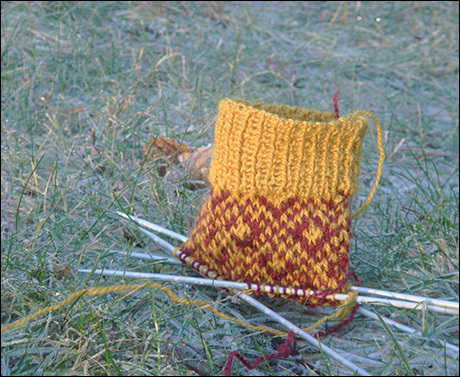 The second is started, and is in fact at the thumb gusset right now. I took these pictures yesterday, and got some knitting time in the evening while we were playing Monopoly and eating Christmas candy. My daughter got very interested in them, and is asking for a smaller version. 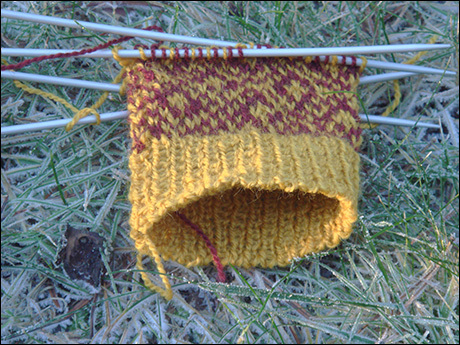 Endpaper mitts number two might be on the needles in the beginning of next year. The friendship shawl has advanced to bud row number fifteen, but you know, unblocked lace isn’t that photogenic, so you have to trust me. No picture evidence will follow. 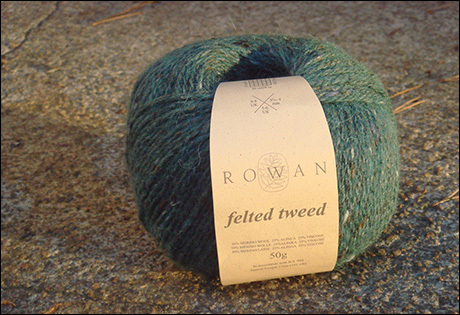 And some new yarn arrived in the mail: Rowan Felted Tweed in the colour Watery. Eight balls, to be transformed into the Tangled Yoke Cardigan. And to all friends out there in the world that celebrates: Merry Christmas! *The "hat" Ludde is wearing is for protecting his ear hairs from being gnawed on when he's eating. My office can be a little bit cold, and in order to find an easy remedy for my cold hands I cast on for the Endpaper mitts by Eunny Jang. I think most are familiar with Eunny’s pattern, but if you aren’t, it’s a freebie from Eunny’s old blog, to be found here. The mitts start with a beautiful elastic Italian cast on. Fabulous instructions on the Italian cast on can be found on Francesca’s blog, complete with video showing how to really do it (I didn’t get the written instructions and pictures at all when I cast on for the Anemoi mittens, but the video, it made finally everything clear for me). 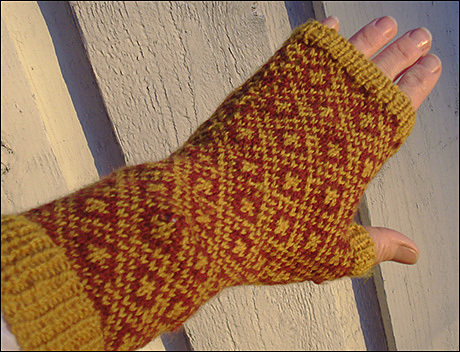 The mitts are knitted on 3 mm dpns, and the yarn is my usual favourite, Vuorelma’s Satakieli. It has been a bit colder again here in the Helsinki area of Finland, but, alas, no snow. And today has the temperature been on plus side again. December? No, feels more like early November to me. The children have started to worry about the snow, or more precisely, the lack of snow. What if there will be no snow for Christmas? Horrible thought according to them! Look at the tubular cast on!